When you pick up a kid’s picture book, you generally don’t do so with the intention of reviewing it. However, if the publisher sends the book to you and asks that of you, that is what you do. So as I sat down to read (Bunny) to my children, I did so both as a father and a reviewer. What do you look for in a kid’s book? Nice pictures? Character depths? A gripping narrative? Age-appropriate language? I guess the ultimate question is, do my kids like it? This is how Sally Lloyd-Jones ends her book Bunny’s First Spring. 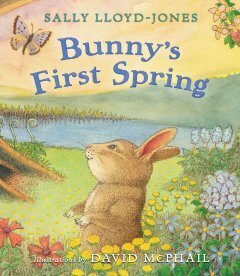 She has written a cute story about the first years a newborn rabbit’s life. The rabbit, aptly named “Bunny” makes observations of the world around him as the seasons change.He also observes some of those same changes in himself. I have generally appreciated Lloyd-Jones’s books, especially her wildly popular Jesus Storybook Bible. My children have also enjoyed some of her other books. The publisher, Zondervan, recommends this book for ages 4-8. My children are significantly younger than that, and the story suited them just fine. On the whole, Sally has done a good job. I don’t think this book is going to become another classic; but nor do I think I will leave it sitting on the shelf. For all the good that I liked in the book, there is one thing that seemed to bother me. There are some pages of the book that seems to have a poetic flow to them, but there are others that do not. As a father reading the book out loud to my children, I found myself wishing that there were more rhyme and rhythm to the story. Perhaps I have just read to many kids books, but I was expecting that from the book, and it didn’t deliver. Disclosure of Material Connection: I received this book free from the publisher through the BookLook Bloggers book review bloggers program. I was not required to write a positive review. This is republished material from my blog Caskets and Jesus.